The top Republican on the Senate Armed Services Committee sought to weaken support for a resolution opposing President Bush's Iraq war strategy, saying Sunday that supporters are intellectually dishonest. Arizona Sen. John McCain, a 2008 presidential candidate, contended the bipartisan nonbinding resolution amounted to a demoralizing "vote of no confidence" in the U.S. military because it criticized Bush's plans to send 21,500 more troops to Iraq without offering concrete alternatives. "I don't think it's appropriate to say that you disapprove of a mission and you don't want to fund it and you don't want it to go, but yet you don't take the action necessary to prevent it," McCain said. "In other words, this is a vote of no confidence in both the mission and the troops who are going over there," he said, noting the proposal does not seek to cut off money for troops. "I do believe that if you really believe that this is doomed to failure and is going to cost American lives, then you should do what's necessary to prevent it from happening rather than a vote of 'disapproval,' which is fundamentally a vote of no confidence in the troops and their mission," McCain said. An early test vote is tentatively set for Monday. 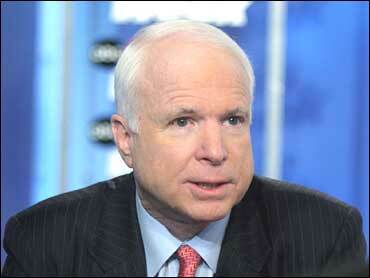 A fellow Vietnam veteran, GOP Sen. Chuck Hagel of Nebraska, disagreed with McCain's assessment. Hagel said the resolution would make clear the Senate's belief that Bush's policy is misguided. Hagel said the proposal also lays out alternatives such as moving troops away from the sectarian violence and closer to the Iraq border to provide "territorial integrity." "We can't change the outcome of Iraq by putting American troops in the middle of a civil war," said Hagel, who is considering a run for the White House in 2008. The Democratic-controlled Senate heads toward a showdown this week on the bipartisan resolution by Sen. John Warner, R-Va. In a bid to attract more GOP support, Warner added a provision pledging to protect money for troops in combat. The newly-worded resolution states that Congress "should not take any action that will endanger United States military forces in the field, including the elimination or reduction of funds for troops in the field." That compromise, however, drew the ire of some Democrats, including Sens. Christopher Dodd of Connecticut and Russell Feingold of Wisconsin, who said it leaned too far in endorsing the status quo. They want to see binding legislation to cap troop levels, force a new vote to authorize the war or begin bringing troops home. Republican leaders worked to block a vote on Warner's resolution. They insisted that several proposals be considered and each be subject to 60 votes — a strategy that could dilute support for Warner's measure and make it tougher for any measure to pass. McCain, who is sponsoring a resolution expressing support for a troop increase and setting benchmark goals for the Iraqi government, sought to capitalize on some of the Democratic division. Democrats hold a 51-49 working majority in the Senate. He said Warner's proposal makes no sense for Democrats who want stronger action. It also risks undercutting a military mission that could haunt the U.S. in the future should it fail. "The consequences of failure are such that you will see a level of violence that far exceeds anything that we have seen," McCain said. "I believe we've got a great general there. I believe that this new strategy has a good chance of success." Hagel said the Warner resolution strikes a careful balance for a majority of senators who oppose a troop buildup but differ on the appropriate response. If the resolution passes, some Democrats may choose to move forward with stronger measures against the war, he said. "This is not a cut-and-run resolution," Hagel said. He called McCain's proposal meaningless because it offers benchmarks but does not spell out what the U.S. government will do if the Iraqi officials fail to meet them. "What are the consequences? Are we then going to pull out?" Hagel asked. "Are we going to cut funding? Now, that falls more in the intellectually dishonest category." Hagel and McCain appeared on ABC's "This Week."